At the time of new connection customers can get their last paid bill of the Landline/GSM/CDMA number to verify the genuineness of the customer. Above charges under bsnltariff plan is inclusive of Service Tax @10.30%. Circles can suitably adjust the price band upto Rs.3 (+/-) may be vary of above price considering the BSNL Telecom Circles Local market condition and according to technical feasibility. In case of Assam, J&K and North East LSAs validity of plan is subject to the guidelines/instructions issued by Govt. of India/Regulatory Authority from time to time. The above "Parivar" plan is going to be offered through BSNL CSC only. No concession in call charges from Landline/GSM/CDMA number to the “Parivar Plan ” mobile number will be allowed. Off-net call charges for “Local Azadi Pack” for Assam, North and J&K Circle are also revised from 30p/Min to 45p/Min. The Off-net call charge in respect of per sec STV with MRP Rs.59 (for use by Lifetime customer) is revised from existing 1p/sec to 1.2p/sec. 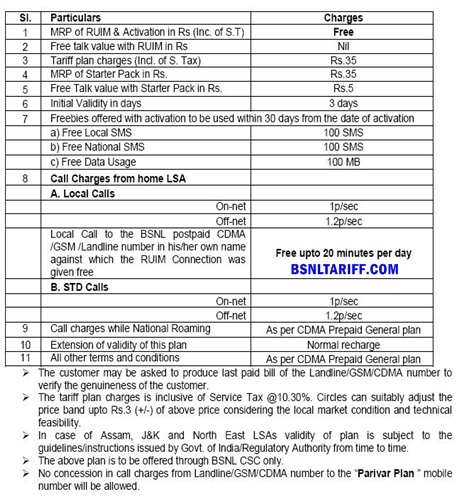 The above bsnltariff will be starts with effect from 01.10.2011. According the 43rd Amendment of Telecom Tariff Order issued by TRAI the implementation of the revised bsnltariff is to be made.